Typically, C-frame presses are designed to take up less floor space than other presses as well as to provide minimal stroke deflection. Additional benefits of C-frame presses include work accessibility, increased open area, and work approach advantages. 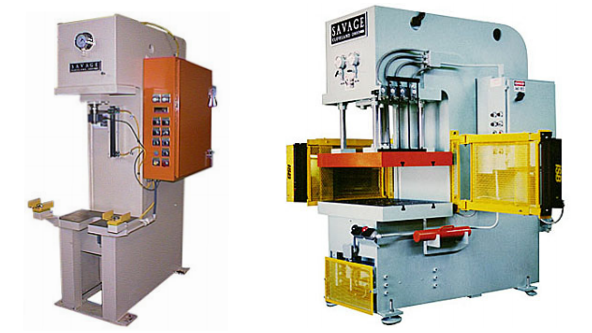 C-Frame Presses – Savage Engineering & Sales, Inc.
Offering precision and control, C-Frame presses are used in a diverse collection of applications including punching, blanking, coining, straightening, forming, bending, drawing and assembly work. industrial, in the manufacturing and fabrication of a variety of hardware including fasteners and spring clips; automotive, in order to form parts such as engine mounts, connectors and terminal lead frames; medical, to form critical devices including many surgical instruments; and electronics, to manufacture electrical components such as bandolier pins, electronic connectors and diverse computer parts. Stamped parts from C-frame presses are formed from a range of sheet metal materials including copper, titanium, stainless steel, and aluminum. There are many different designs that fall under the heading of a C-frame press. However, at its most basic, a C-frame press consists of a ram, or press, a die and a press bed. Stampings are formed by means of the die, a press tool consisting of a specially designed cavity, which is used to shapes metal parts from the inserted sheet metal. The upper component of the die is connected to the press slide, and the lower component id connected to the press bed. The ram then performs the necessary shaping operation by pushing the sheet metal through the die. An example of a special type of C-frame press is one that features a crown suspended over the press bed and an open portion in the front of the press that allows for easy access to the die set. C-frame presses are able to be operated manually or automatically, and are typically a type of mechanical press versus a type of hydraulic press. In addition, C-frame presses are able to take up less floor space than most hydraulic presses due to their narrow and yet sturdy C-shaped frame. The frame of the press is typically made from steel because of its favorable characteristics for stamping applications, including the ability to provide minimal deflection. C-Frame Presses C-frame presses, also known as gap-frame presses, are streamlined-sized, press-shaped like a "C" and normally consist of a single press application.